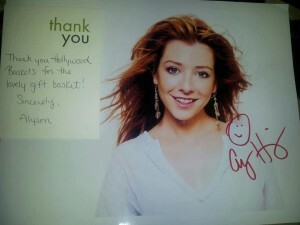 Alyson Hannigan Says Thank You! Alyson Hannigan thanks us for her cute baby basket! Alyson Hannigon Gets Gifted by Hollywood Swag Bag With Deborah DidiPop Poppink, Ela Lewicki Cacciola,Bari Koral, Darlene Roberts Giol, Lori Cohn, Jin Jun,Nancy Leotta, Carla Masterson, Judi Smith, Erin KrinklzBaby, Julia Lambie, Amy Gersh Rzepka, Julia Ormond, Dashiel St. Damien and Lisa Gal Bianchi. Hollywood Baskets makes US Weekly for MY FM Event! !